| Stunning Architecturally Designed Family Residence That’s An Entertainer’s Paradise Literally! 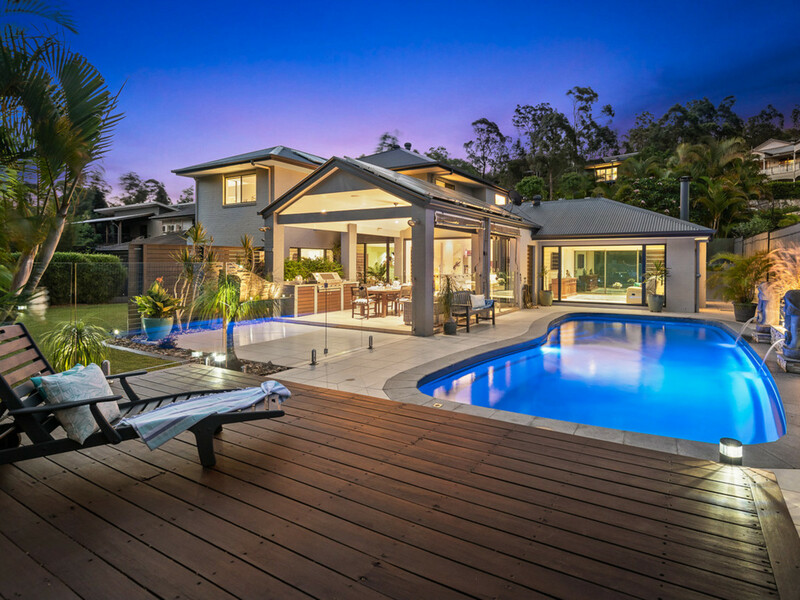 Stunning Architecturally Designed Family Residence That's An Entertainer's Paradise Literally! Combining a sumptuous blend of impeccable style, indisputable quality and an unrivaled lifestyle, this sophisticated abode is built by Paradise Homes’ and will have you captivated from the moment you first inspect. Head through the fully fenced front yard and into the home to discover the tiled & polished timber floors, ducted air-conditioning and chic Plantation shutters all complimented by a soft yet modern colour palette. You have your choice throughout the home of 4 expansive living spaces including; the upstairs family room, a downstairs casual living space with a floor to ceiling glass window overlooking the picturesque feature garden, an ambient formal lounge with fireplace and another floor-to-ceiling glass window that highlights the sparkling in-ground swimming pool and a well-positioned casual dining room near the kitchen. The casual meals area leads effortlessly to the gourmet open plan kitchen which will makes any chef’s heart skip a beat – 30mm stone bench tops, a generous walk-in pantry, room for a double door fridge (with plumbing), recessed sinks, glass splashback and quality appliances including a 5-burner gas cook top, range hood, dishwasher, oven and steam ovenyou really will want for nothing whilst cooking in this amazing kitchen. This area seamlessly flows through the timber and glass bi-folding doors to the expansive rear entertaining area with outdoor blinds. Adjacent to the in-ground swimming pool, this is the ideal place to entertain or just relaxand with an outdoor BBQ area, outdoor speakers and absolute privacy, you’ll do plenty of entertaining all year round! Back inside you’ll find a separate laundry, downstairs bathroom, a separate bar/wine-room’, oodles of storage and a separate large home office with an elegant built-in desk and shelving. The lawns and gardens are meticulously manicured and you’ll easily recognize the care and attention that’s gone into the upkeep of this luxurious home! Extra features include: a 5KW solar power, solar heating for the pool, wired speakers throughout the home, an alarm system, ducted vacuum, imported glass throughout, tinted windows, a herb garden, two water tanks and plenty of room to secure extra vehicles. A property like this is truly a rare find and in such a prime location – it is easily one of the finest in Greenwoods Estate’. You’re only minutes to local shops, public transport, numerous public and private schools and many local parks. Offering a lifestyle that is second to none combined with modern chic design and every creature comfort you could imagine, you’ll quickly recognize the opportunity that is presented right here – Don’t delay as this one will attract very strong interest!